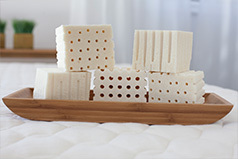 People often ask us how to choose the best firmness for their natural latex mattress. There are a lot of variables involved in firmness, and they all interact in different ways with different bodies. That’s why it helps to have a savvy guide. Here, we’ll explain some of the technicalities that will help you understand the physics involved. Then you’ll want to let go of the thinking part, and be open to experiencing or estimating how latex layers of different firmness—and in different combinations—will interact with your body. Believe it or not, we can even guide you in this process over the phone. Having listened carefully to thousands of people with different sleep issues describe their needs, we know how to ask the right questions. Most materials used in the mattress industry are measured in density, ILD (for Indentation Load Deflection), and recovery time. Density is a measurement of the mass per unit volume expressed as kilograms/m3 (cubic meters). Density is the normal unit of measurement for Dunlop latex, and it can vary from around 60 kg/m3 to about 95 kg/m3. Very soft latex density is 60 kg/m3. When latex is 95 kg/m3, it will be very firm. And there is everything in between. Density is a verifiable, scientific measurement. ILD is a measure of firmness and is the normal unit of measurement for Talalay latex. Talalay firmness can vary from about 12 ILD up to about 50. In bedding, an ILD of 12 would be regarded as very soft—you’d nearly sink through it. An ILD of 50, on the other hand, is very firm. If you sit on the edge of a mattress made with layers that firm, it won’t sink beneath you. Recovery time refers to the amount of time it takes a piece of foam to return to its original shape, and it’s one way in which memory foam is measured. We’ve seen memory foam that recovers in 4 – 6 seconds as well as “fatigued” memory foam that takes many minutes to recover. What different companies produce can vary a great deal. Whether we are evaluating density, ILD, or recovery time, the numbers will change from one piece or layer to another, but also within a layer from side to side and head to foot (though not drastically). The height or thickness of a latex layer also varies by manufacturer. When “zoned” latex is manufactured, densities are changed by the placement of more or fewer baking pins in different parts of the mold. The pins project up through the liquid latex solution, carrying heat. More holes will make the resulting area of a layer softer and less dense, and fewer will make it denser, therefore firmer. For example, there may be denser zones to support the greater weights of shoulders and hips, and less dense zones for the lighter head and feet. How Does More Latex Affect How a Latex Mattress Feels? 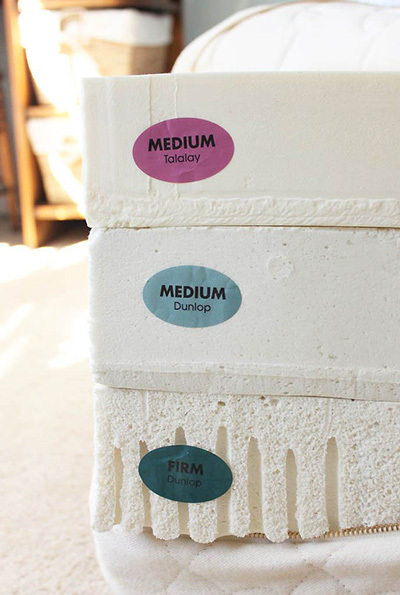 When you stack sheets of latex on top of one another and cover them with ticking (the mattress casing), you’ll notice a big difference in how it will feel even if the individual measurements for each sheet are all the same. In other words, lying on top of a single 3” layer of latex with a density of 80, ILD of 32, and a fast recovery time will feel very different from lying on 6” or 9”--multiple layers that have the same technical measurements. Further, even if you could perfectly standardize the density, ILD, recovery time and height of each layer of Dunlop, changing the casing material also makes one mattress line feel different from another. Generally, more layers of latex add up to greater comfort for most adults, although for children or very petite people, the maximum depth isn’t necessary. How the casing is constructed, and of what materials, are important factors too. There are so many variables that affect how a particular mattress will feel that we always advise testing one if you can, or at the least working with a knowledgeable representative. Even the best advisors can’t guarantee a foolproof fit, but their knowledge and experience will greatly improve your chances of a receiving an extremely comfortable mattress. We recommend working with a company that not only allows you to swap out layers if needed (about 10% of our customers use our Latex Exchange) but is savvy enough to guide you skillfully about firmness in the first place. And you know who we think that is! Learn the subtle differences between the two types of latex in our customizable mattresses: Dunlop and Talalay.